The Mediation Act, 2017 was passed in September 2017 and is the culmination of a slow but steady increase in the use of mediation to resolve disputes in a variety of contexts. The workplace and employment arena has also seen a growth in the use of mediation compared to more time-consuming adversarial processes such as investigations and litigation, to deal with conflict and complaints. So is ‘mediation’ the new kid on the block, the panacea for all people problems, the new buzz word to be doing and training in and trying to introduce into an organisation? There is no doubt that mediation as an intervention has many benefits. Research into workplace mediation shows a high degree of satisfaction from users of the process as well as settlement rates in the 80-90% range. The speed and informality of the intervention minimise the long-term damage to working relationships, in contrast with the lengthier, formal and adversarial nature of investigations. However, the research is also showing is that parachuting in external mediators in a piecemeal fashion, as a last resort with hard cases, has limited impact. 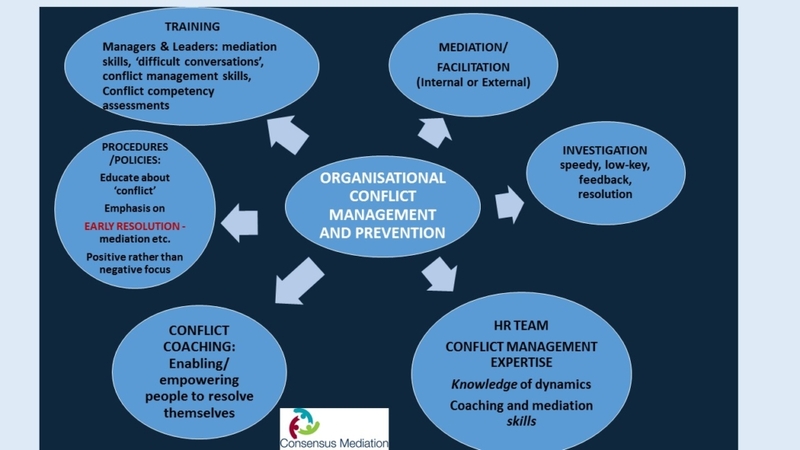 Rather, the focus needs to be on pro-active prevention and management of workplace conflict, where it’s not just about ad hoc mediation interventions but implementing a ‘mediation mindset’ throughout the organisation. So what do we mean by a ‘mediation mindset’? A mediation mindset is focused on embedding the understanding of conflict not as something to be avoided or suppressed. Instead, it’s about accepting the inevitability of conflict and taking a strategic approach in managing it. It’s about ensuring that both the skills and responsibility for effectively managing conflict are devolved right throughout the organisation. ACAS, the UK’s version of the WRC have carried out a number of in-depth studies over the past 5 years into dispute resolution in the workplace and in particular the role of mediation. (See below for further reading and references). This infographic highlights a smorgasbord of interventions and processes that could underpin a co-ordinated and cohesive strategy to prevent and manage conflict and complaints in organisations. Organisations need to have a robust mediation policy with clear guidance, expectations and procedures that educate employees about conflict management and emphasise the benefits of early resolution and options such as mediation. A detailed overview of how the mediation process works, presented both in text and graphic format. It also spells out ten key benefits of using mediation to resolve issues. Introduction of a new role and step in the process – the Designated Person* (as cited in the HSA Code of Practice for Employers and Employees on the Prevention and Resolution of Bullying at Work). Their function and role is to oversee the complaint once it reaches the formal stage, part of which involves providing a compulsory information session on mediation (emphasis added). One of the key barriers identified across all of the ACAS research was resistance from line managers to implementing soft skill approaches such as mediation and/or having difficult dialogues. This stemmed to a large extent from lack of confidence as well as skills/know-how in handling difficult conversations and/or mediating informally. 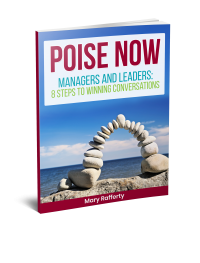 Fear that efforts to address performance or behavioural issues might result in a backlash grievance fed into their reluctance to engage with potentially confrontational conversations. There was also a concern that such conversations could lead to grievances or complaints against managers. The research identified a number of measures that could support managers, whom it identified as key actors in the management of conflict in the organisation. This was seen as a central aspect of the HR strategy and also reflected in the development of key managerial competencies within the organisations surveyed. Engagement and buy-in to a culture of resolution, at senior levels, to be modelled and communicated throughout the organisation. People managers need to feel confident that they will have support to put the time and effort into resolution interventions, as well as around any legal exposure they might fear, in addressing ‘difficult conversations’. Competency frameworks for managers at all levels to include people skills. For example, at the recruitment stage in one organisation, part of the process involved participating in a thirty-minute role play about a performance management issue with a member of staff (Latreille and Saundry, 2015). Training and coaching in relevant skill areas e.g. A recent CIPD survey evidence revealed that ‘conflict management’ and ‘managing difficult conversations’ were the two most cited skills that line managers found most difficult to apply (CIPD, 2013). They cited the example where in one organisation this mediation training had helped to rebuild relationship between managers and trade union representatives such that “an adversarial approach to disciplinary and grievance issues was replaced by one in which the parties sought to resolve issues at the earliest possible stage through informal discussion and negotiation” (Saundry and Wibberley, 2015). While the role of operational managers in handling conflict constructively is critical, the research also pointed to the continued need for HR to strategically co-ordinate and foster the development of a resolution culture. This means on-site, hands-on support (rather than devolution of all HR to remote shared services) as well as adequate training – in mediation skills, conflict coaching as well as having a good theoretical knowledge base around the dynamics of organisational conflict competence. “…[O]rganisations [need] to adopt more integrated approaches which locate conflict management as a central element of HR strategy” (Saundry et al, 2014). *This role is not the same as the ‘Contact Person’ whom parties to a complaint may contact and who will provide listening support and explain the resolution options but not in any way intervene or advise people what to do.